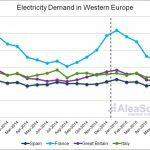 July 23rd, 2015– Electricity prices in the main European wholesale markets were higher in the first half of 2015 than in the same period of 2014. The only exception was the EPEX SPOT – Phelix market, whose average price was slightly lower. A descending price trend between February and May 2015 can be observed in this market, as well as in the markets for France and Italy. On the other hand, in Spain and Portugal prices were clearly influenced by the low hydroelectric production. The prices of the N2EX market are expressed in €/MWh, they have been obtained from original values in £/MWh. 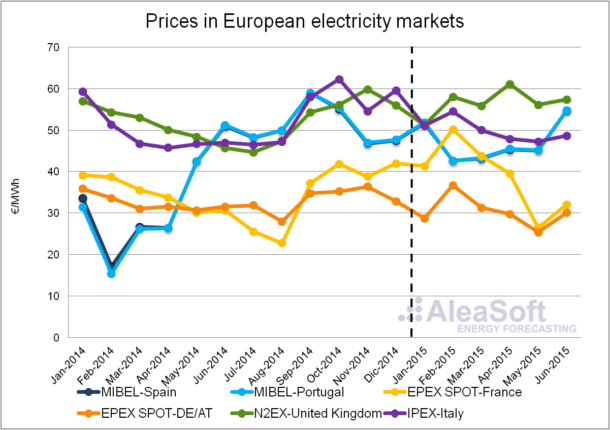 In the first half of 2015, the behaviour of electricity prices in the day-ahead MIBEL market (Spain and Portugal) was clearly influenced by the low hydroelectric production during winter and spring, when usually the greatest hydroelectric production is registered. This production gap was filled with a coal and gas based production. 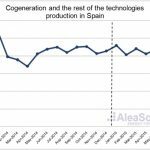 The higher cost of these technologies entailed an average price of 47.12 €/MWh in the first half of 2015, 14.06 €/MWh more expensive than the same period of 2014. Similarly, in Portugal, the average price in the first six months was 47.22 €/MWh, 14.83€/MWh higher than in first half of 2014. The lowest hourly price of this period was 4.00 €/MWh both in Spain and Portugal. It was registered during 8 hours in January and February in Spain, and only 3 hours in February in Portugal. In the first half of 2015, not a single hour registered a price of 0 €/MWh. This hadn’t occurred in the first six months of the year since 2009. In the EPEX SPOT – France market, the average price in the first half of 2015 was 38.75 €/MWh, 4.14 €/MWh more than in the same half of the previous year. The price was especially high in February, reaching a monthly average of 50.15 €/MWh, 11.46 €/MWh more than in February 2014. In the next months the price lowered to the monthly average of 26.48 €/MWh in May, 3.6 €/MWh less than in the previous May. In the first six months of 2015, the electricity average Price in the EPEX SPOT – Phelix market (Germany and Austria) was 2.14 €/MWh lower than in the previous year, reaching 30.22€/MWh. The monthly average price had its maximum of 36.72 € /MWh in February, and similar to the French market, it fell to 25.36 €/MWh in May. The year-on-year variations were +3.13 €/MWh in February and -5.27 €/MWh in May. The British market N2EX registered an average price of 41,40 £/MWh (56,57 €/MWh) in the first half of 2015, the highest among the analysed markets. This entailed an increase of 0,85 £/MWh compared to the same period of 2014. The highest monthly average price was in April, reaching 44,11 £/MWh (61,08 €/MWh), 2,81 £/MWh more than in April 2014. During the first half of 2015, the average price in the Italian market IPEX was 49.83 €/MWh, only 0.37 above the average in the same half of the previous year. As well as in the EPEX SPOT analysed market, there is a declining price trend between February and May. In terms of monthly average price, the greatest year-on-year variation was in January (-8.17 €/MWh) because prices were especially high in January 2014. AleaSoft forecasts for the second half of 2015 indicate stabilization in the average price in the MIBEL market compared to the second half of the previous year. Prices on a year-on-year basis are expected to be higher in EPEX SPOT – Phelix and EPEX SPOT – France markets. Instead, the prices in N2EX and IPEX are expected to be lower compared with the ones registered in the second half of 2014. IIn the first half of 2015, the Zeebrugge gas average price was 21.25 €/MWh, 1.04 €/MWh more than in the last half of 2014. The monthly average price was stable around this value, and its lowest value was 20.04 €/MWh in January. On the other side, the NBP gas average price was 16.03 £/MWh in the first half of 2015, only 0.25 £/MWh lower than in the previous six months. The lowest monthly average price was 15.37 £/MWh in June, a value 1.97 £/MWh superior to that of June 2014. The average price of the Brent oil barrel was $57.86 in the first half of 2015. The monthly average price started in its lowest value in January with $48.12 after the important fall during the second half of 2014. It increased to $64.10 in May. In June, it slightly lowered to $62.63. 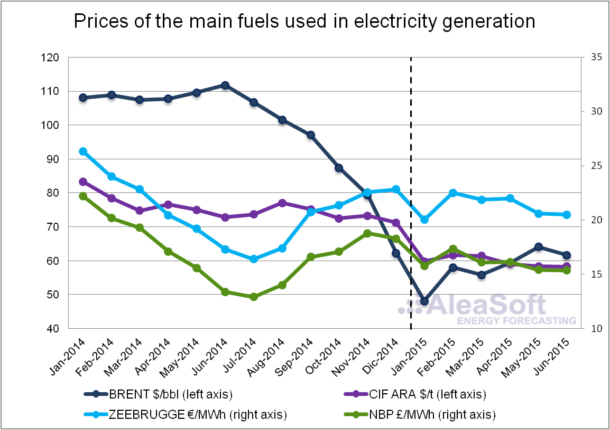 The behaviour of the CIF ARA European coal price during the first six months of 2015 was relatively stable around the average value of 59.76 $/t. This value was 15.60 $/t lower than the average price during 2014. For the second half of 2015, AleaSoft forecasts indicate a small increase in the Brent barrel price together with the Zeebrugge gas price and the NBP gas price. On the other hand, price of CIF ARA coal is expected to be slightly lower. 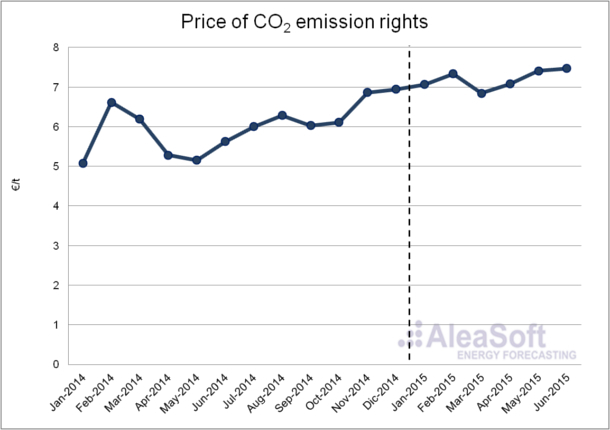 The CO2 emission rights price had a slightly ascendant behaviour during the first half of 2015, reaching a monthly average price of 7.47 €/t in June, 0.50 €/t more than the average price in December 2014. Following Aleasoft’s forecasts, the CO2 emission rights will be stable during the second half of 2015.